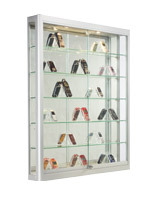 This Display Cabinet Features Two Z-Bar Mounting Accessories for Wall Display Cases! 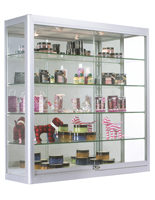 This Display Cabinet Has a Locking Slide Door and Four Tempered Glass Shelves! 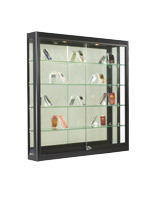 This Display Cabinet Is Fast Shipping! Sliding, locking door provides added security! Matte black finish complements any décor! (2) 20-watt halogen top lights illuminate displayed merchandise! Ships assembled to save setup time! 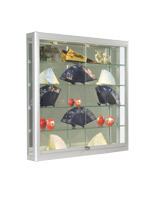 This shadow box showcase, display cabinet is well-fitted with numerous incorporates, including two 20-watt halogen top lights to illuminate memorabilia. The case's light bulbs are fit into recessed eyeball fixtures so you can orient the lights towards the front or rear of the case to get merely the right lighting. A rocker on/off switch is located in the bottom right-hand corner of the case. Five tempered glass shelves are fully height adjustable and secured into the case with rubber-padded shelf clips. The display cabinet incorporates a sliding door with a plunger lock to preclude unwanted entrance to memorabilia. This case mounts to the wall with two heavy-duty z-bar mounts. All hardware and Mounting Instructions are provided. 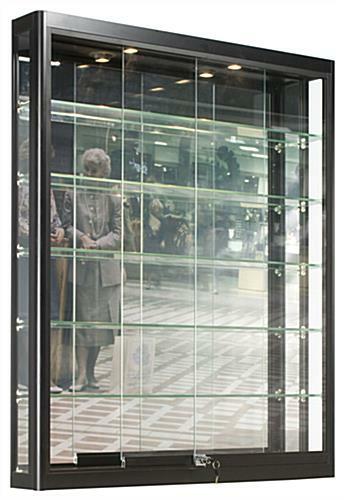 This display cabinet will be an ideal addition to a business office, retail store, museum, hospital or school. 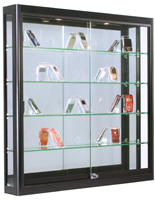 The display cabinet can be utilized to showcase anything from jewelry or sports memorabilia to cell phones, comic books, or cosmetics. Buying a display cabinet is an ideal alternative to a tower-style showcase, as it utilizes commonly underutilized wall area, rather than floor location. A retail display floor can get extremely teeming with counters, cash wraps, and display cases, let alone leaving room for clients to navigate through your store. 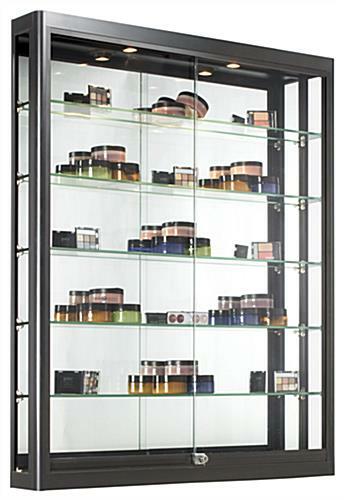 A display cabinet brings products up to eye level and leaves more room for your customers to effect their method through your organization. 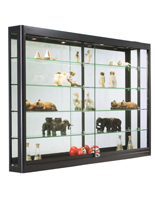 This black display cabinet, likewise recognized as a shadow box, is affordably priced, so you can set up your whole store with display cabinets.